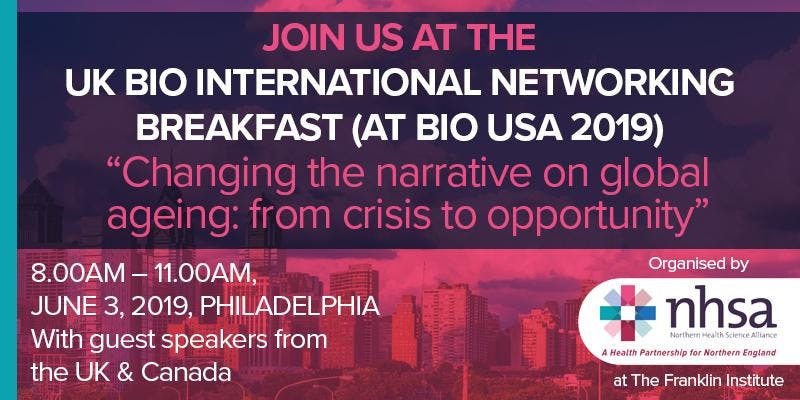 WHAT: Join the UK BIO INTERNATIONAL NETWORKING BREAKFAST “Changing the narrative on global ageing: from crisis to opportunity” to kick-off your BIO 2019 in style in the fine surroundings of the historic Franklin Institute in Philadelphia. WHY ATTEND: With an internationally ageing population across the developed world, countries are waking up to the need to provide solutions which keep our citizens living healthier lives as they get older. Over £98m has been committed to the UK Government’s Grand Challenge to “Ensure that people can enjoy at least five extra healthy, independent years of life by 2035, while narrowing the gap between the experience of the richest and the poorest”. The World Health Organisation’s strategy in healthy ageing commits ever member state to five strategic objectives: commitment to action on Healthy Ageing in every country; developing age-friendly environments; aligning health systems to the needs of older populations; developing sustainable and equitable systems for providing long-term care (home, communities, institutions); and Improving measurement, monitoring and research on Healthy Ageing. The UK networking breakfast will discuss these challenges and the opportunities for international innovation arising from them. We will also see what the UK is doing to address healthy ageing and the funding and investment opportunities arising from them. Professor David J Burn FMedSci, Chair of the Northern Health Science Alliance. Pro-Vice Chancellor and Professor of Movement Disorders Neurology, Faculty of Medical Sciences, Newcastle University Medical School, United Kingdom. Professor Jennifer Boger Director, Intelligent Technology for Wellness and Independent Living (ITWIL) lab. Schlegel Chair in Technology for Independent Living, Research Institute for Aging, Assistant Professor, Systems Design Engineering, University of Waterloo, Canada. Professor Chris Todd, Professor of Primary Care and Community Health in the School of Health Sciences, University of Manchester, UK where he leads the Healthy Ageing Research Group. Chris is the Director of the National Institute for Health Research (NIHR) Older People and Frailty Policy Research Unit. Chris is a NIHR Senior Investigator and member of the NIHR College of Senior Investigators. Lee Omar, CEO, Red Ninja which co-creates technology using their expertise in artificial intelligence, data science, Internet of Things, smart cities, electrical engineering and app development. 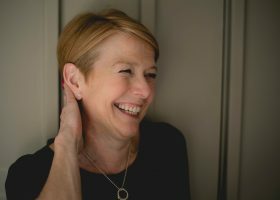 Has led the design and development of several digital health products that have been co-created by NHS, Red Ninja, Patients and their families. Advises governments, including President of India on Smart Cities. Whether your background is academia, business, research, government or other, if you have an interest in the global challenge of ageing, this is a networking event that you must attend. Places are limited to 180, so please sign up early to avoid disappointment. BIO US, held this year in Philadelphia from June 3 to 6, brings together the world’s leading lights in life sciences with over 16,000 attendees from international governments, industry, pharma, academics and thought-leaders in the life sciences. The conference is a hotbed at the interface of innovation and commerce and covers everything from medical technology, digital health, personalised medicine including genomics, to advanced therapeutics and more. The UK’s international networking breakfast at BIO 2019 is organised by the Northern Health Science Alliance, a UK-based organisation that brings together industry, government and health leaders from across the UK to network, forging alliances and fact-finding on the latest developments in the Bio Economy. Last year around 200 global attendees from industry, pharma, academia and government joined the NHSA’s UK Networking Bio Breakfast supported by UK DIT Trade Minister Baroness Fairhead, who gave a keynote speech, and sponsors Alderley Park and Wolf Greenfield and Sacks. There were 460,700 twitter impressions on the UK’s presence at BIO with over 161 global leaders tweeting about the UK presence, much of which came from NHSA activity. Media coverage of the North’s activity appeared in the Wall Street Journal, the main UK government website Gov.uk and specialist trade magazines. AN innovative new approach to reduce the risk of older people breaking bones could save the NHS over £35 million, across the North of England, if it is fully scaled-out across the region.